No matter where you live, disasters – whether natural or man-made – often strike quickly and unexpectedly; local officials and relief workers may not be able to reach you or your loved ones right away. Thus, knowing what to do before, during and after an emergency is incredibly important, especially for older adults. While individual needs and abilities may vary, every person can and should take basic steps to prepare for various disasters. Maintaining your kit is important. Review the contents at least every six months or as needs change. Replace food, water, batteries, medications and other perishable items based on expiration dates. Depending on the nature of the disaster, you may either have to find shelter-in-place or evacuate. Know the safe places in your home in case you need to shelter-in-place as well as the best and quickest escape routes from your home and neighborhood. Choose several destinations in various areas so you have options. Note that emergency public shelters only allow service animals so plan in advance for alternatives that will work for both you and your pets, if applicable (e.g., family, friends, local veterinarian). Make a list of family, friends and other contacts that can help you in an emergency— for example, people who may be willing to host you. Share your concerns and limitations and discuss an action plan (e.g., transportation needs, evacuation routes). Also, let them know where your emergency supplies are located. Arrange for someone to check on you in the event of an emergency and make sure he or she has a key or other means to access your home. Practice the emergency plan to make sure potential needs are adequately addressed and review the plan every six months. Consider a system where each family member calls the same loved one in the event of an emergency. Note that it is often easier to make long-distance calls during a disaster so out-of-state contacts may be better able to get in touch with separated loved ones. If you undergo routine treatments administered by a clinic or hospital, or if you receive regular services such as home health care or home care, talk to your service providers about their emergency plans. Work with them to identify back-up providers within your area and the areas to which you might evacuate. If you use medical equipment in your home that requires electricity to operate, talk to your health care provider about what you can do to prepare for its use during a power outage. Ask your utility company about emergency procedures and know how and when to turn off water, gas and electricity. Keep any tools you may need nearby. A disaster can disrupt mail service for days or even weeks. If you receive any benefits or checks through the mail, you may not have access to your account during an emergency. Consider setting up a direct deposit system through your bank to ensure immediate access to your funds. Think about the risk for both natural (e.g., hurricanes, flooding, winter storms and earthquakes) and man-made (e.g., hazardous material spills and transportation accidents) disasters. Research various emergency preparedness programs in your local community for further, location-relevant tips and resources – how will you be warned of a disaster and how will authorities communicate with you during and after a disaster? Some local emergency management offices maintain registers of seniors so they can be located and assisted quickly in an emergency. Weather service-sponsored radios often provide the earliest warnings of weather-related and other emergencies, and can be programmed to alert you to disasters in your specific neighborhood. 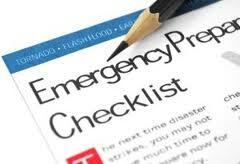 We hope that you found our emergency preparedness tips helpful! Have additional suggestions? Let us know in the comments below or on our Facebook page!